Carla Irwin & Associates provides customized compliance solutions, including strategy, plan development, full service audit support, and training. 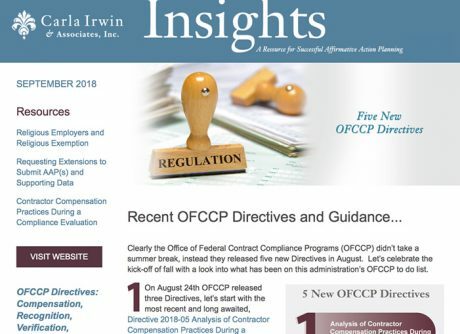 Let’s celebrate the kick-off of fall with a look into what has been on this administration’s OFCCP to do list. 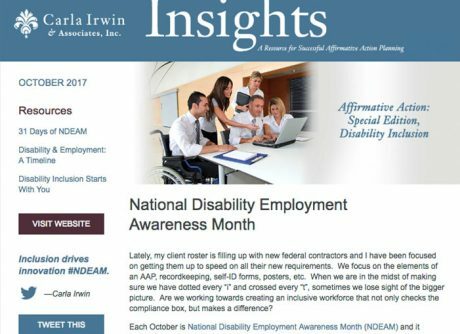 Carla Irwin & Associates, Inc. specializes in developing and implementing Affirmative Action Programs (AAP) for Federal Contractors. With clients ranging from small business to Fortune 500 corporations, we supplement our clients’ human resources functions with our own in-depth AAP knowledge and expert systems. Contact us today to get started. From affirmative action plan structure to development and implementation, we collaborate with you to provide a customized, cost-effective and high value solution. We provide full-service hands on audit support from the receipt of the scheduling letter to on-site visit management through closure. 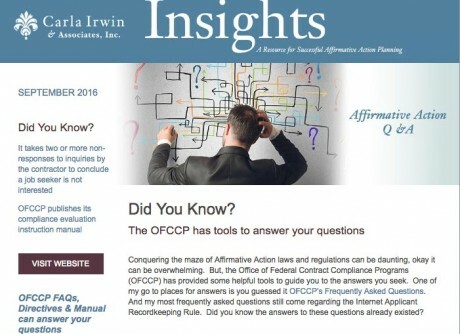 We believe internal knowledge of affirmative action is essential to implementing your affirmative action program. We offer customized training options on a range of topics. 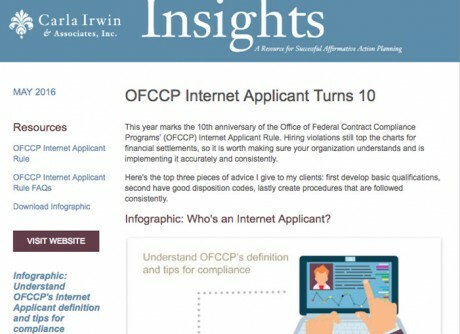 Read the latest issues of our monthly newsletter, Insights. News Release U.S. Department of Labor Extends 2014 TRICARE Enforcement Moratorium WASHINGTON, DC –The U.S.
Carla is an AAP expert and was a tremendous asset in helping one our locations develop their AAP on time. One of Carla skills that separates her from other AAP consultants is her approach. Her approach is to educate our HR staff and ensure that understand all the facets of completing a successful AAP. We value our partnership with her. I have worked with Carla for four years. She has worked as outside counsel creating our Affirmative Action plans for five offices. Carla has taught me so much that I am able to be an on-site expert when co-workers need immediate information. I would never have been able to achieve so much in such a short time if it wasn’t for working with Carla. She is always available to answer even the easiest question, and has been able to be creative when needing to work around difficult situations. I highly recommend Carla! Carla has provided expertise in establishing a consistent usable process within our HR department. More importantly I have appreciated her patience, communications skills and diplomacy. 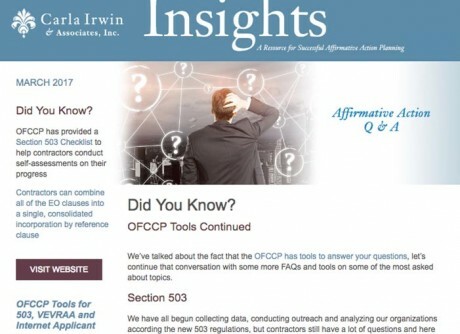 I highly recommend Carla to any Talent Acquisition group or Human Resources Department where OFCCP regulation help is needed. She has brought a significant value to my teams approach. Carla offers me peace of mind when she works with me and our locations to finalize AAP plans. I know I can trust her to do a great job and be aware of all the details. She always goes above and beyond in order to get a plan completed. In addition to the services she provides on our plans, Carla is extremely knowledgeable on the happenings within the Affirmative Action community. She puts out a monthly newsletter to keep her clients current, is always sharing great recommendations for the company, and is willing to answer any questions we may have.